Spring is here and the flowers are blooming. Now is the perfect time to check out the infamous California wildflowers nearby and the secret gardens of downtown Morro Bay. Montana De Oro – A state park just 8 miles from Morro Bay offers a variety of wildflowers and trails for all abilities. Shell Creek Road – A local favorite less than an hour inland, you’ll find private cattle grazing fields along the road showcasing a variety of blooms with designated turn outs to get a closer look. Carrizo Plain National Monument – Here the hills are blanketed with color. Just be sure to stay on the trails to not disturb the wildflowers. Figueroa Mountain – Gain a different perspective by riding by the wildflowers on your bike. This area offers challenging biking with beautiful views. The experts expect the peak bloom to only last a couple more weeks, so don’t miss out and plan your visit today! But you don’t even have to venture out of Downtown Morro Bay to enjoy the spring. The downtown ‘secret gardens’ give visitor an opportunity to spend time outdoors right in the middle of great shopping, eating and sightseeing – you just have to find them. Top Dog – This ‘beer garden’ is a great place to relax. Walk to the very back of the café, out the door and down the stairs. You’ll feel like you’ve found a tropical paradise far removed from Main Street outside. Rock Espresso - Enjoy your breakfast, local newspaper, and of course a cup of coffee or two out the back of this café. Laid back and easy to access, the garden feels like hanging out in your neighbor’s backyard. Coalesce – Once you explore the bookshelves inside, be sure to venture to the garden where there is more to see. Luscious and green, there’s even a wedding chapel which often hosts concerts and can be rented for special events. Pizza Port – Take the whole family and the family dog to enjoy a pizza pie on the deck and enclosed yard. It’s also the perfect location for a lazy afternoon of watching the traffic and people go by. Beads By The Bay – Perhaps the most diverse of all the downtown secret gardens, this space has it all from shopping, to a succulent potting station and a craft table where they often host classes. There’s even a shop cat to say hello to. The Siren – Stopping in to grab a drink, watch a game or see a show…you’ll want to take a break on the Siren’s outdoor enclosed patio. It may be small, but it’s well furnished and really comes to life at night with festive lighting. The Gathering Place – Located on the corner of Main Street and Morro Bay Boulevard, this outdoor space is perfect for the whole family. It may not be hidden, but it offers lots of space and fun activities for the kids. Oh, and did we mention there’s a frozen yogurt shop on site? Get your Spring Booklet for a discount. 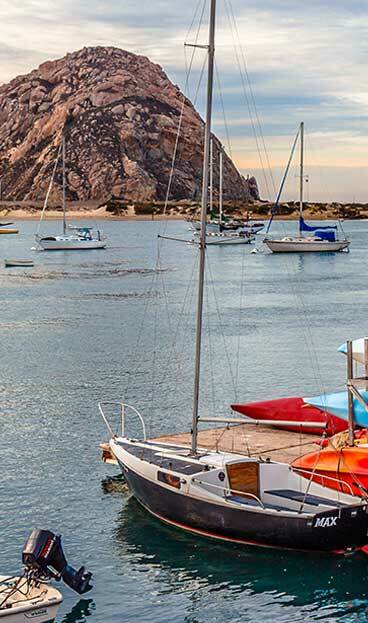 Stay in any Morro Bay hotel April-May and receive discounts on bike rentals, kayak adventures, fishing charters & whale watching excursions to keep the whole family entertained with our Spring Savings Booklets.